Yogurt is a super versatile ingredient or dish in itself. 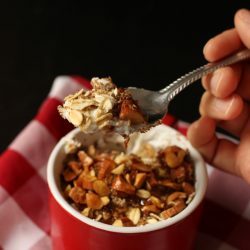 This recipe for greek yogurt with granola contains all kinds of extra goodies to help you start the day right. In a small bowl, layer the ingredients in the order listed. Stir or not, depending on how you like it.